what a wonderful hidden gem,so pleased that i came across this property while searching for somewhere to stay for a family christening in Chester. The hosts were so friendly & the accomodation outstanding. This is our 2nd time staying in the Bakery at Sand Stone Cottages, we had a wonderful time, the cottage has everything you need, with the added bonus of freshly laid eggs, which were delicious. Jackie and Ray are great hosts, who make you feel so welcome. The weather was so nice we even managed to sit in the garden. We will definitely be back again. A superb weekend break in a cosy cottage with everything you need to feel relaxed and happy. We enjoyed fantastic walks from the door. The local pubs are also excellent. It truly is a hidden gem. We will definitely return soon. Thanks! Having just returned from a 10 day stay at Granary Cottage, I was delighted with the accommodation and warm and welcoming personalities of Jackie and Ray. I plan to visit again next year! A lovely 2-night stay in this wonderfully comfortable cottage. Everything we needed to hand, a great bed, linen, towels, woodburner and beautiful walks from the door. I'll definitely book up for my Sandstone Trail walk planned next year. We have just returned from a 4 night stay in Granary Cottage and were delighted with the accommodation which was finished to a very high standard throughout. The log burner made it very cosy with an unlimited supply of logs. Ray & Jackie made us feel very welcome and the free eggs, honey, fruit and milk were most appreciated. The cottage is ideally situated on the Sandstone Trail and the folder of local walks was very useful with several walks direct from the door. We stayed in Baker's cottage for a week at the end of June. The cottage is very well furnished and finished to a high standard. All the little extra touches (milk, eggs, honey) really made a difference to our stay and Ray and Jackie made us feel very welcome. The area is outstanding and the walks are lovely. We will definitely be returning. 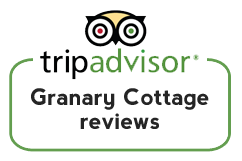 Returning to our website from tripadvisor to make your booking will avoid any third party charges.